Following the custom of his Horite forefathers, Abraham had two wives. Sarah was his half-sister wife and Keturah was his patrilineal cousin wife. Isaac ascended to the throne of Abraham as the firstborn of the sister wife and Joktan ruled in the territory of his maternal grandfather, after whom he was named. Though Isaac ruled after Abraham, he was not the first son born to Abraham. Jews insist that Isaac was Abraham's firstborn son while Muslims insist that Ishmael was Abraham's firstborn son. Risking the anger of both Jews and Muslims, my guess, based on the evidence of Scripture, is that Joktan was the first in the birth order of Abraham's nine sons. This means that he was likely born before Sarah conceived Isaac and before Sarah attempted to gain a son by using Hagar as a surrogate. Joktan (also spelled Yaqtan) is the founder or titular head of the Joktanite Tribes of Arabia. The Jews say that his name means "little" but his name is a version of the name Jonathan, meaning "God gives." Joktan lived about 1987-1912 B.C. That he was a ruler is evident by the solar symbol Y at the beginning of this name. This symbol designates chiefs and rulers. The earliest scripts, such as Thamudic, involved symbols representing not simply general names, but complex related experiences including names, attributes and worldview. A solar symbol such as Y or T or O represented a deified or divinely appointed ruler, his territory, his people, and his resources such as water and gold. This is why the Horite ruler-priests names begin with the solar symbol: Yaqtan, Yishmael, Yitzak, Yisbak, Yacob, Yosef, Yeshua, etc. Joktan is the son of Abraham that most people have never heard of. They think only of Isaac (Yitzak) and Ishmael (Yishmael), the two best known. Joktan is the somewhat "hidden third" son. We explored the biblical theme of 2 sons, and now we must consider the equally important theme of 3 sons. Seeing the bigger picture of Abraham's people requires looking at all 3 sons. To this we add the first-born sons of Abraham: Ishmael (by the concubine Hagar), Isaac (by his sister-wife Sarah) and Joktan (by his cousin wife Keturah). The birth order is not clear, which is strange given the importance of primogeniture among Abraham’s people. We are told that Ishmael was born first, but rejected as the heir upon Sarah's insistence, though she had arranged the situation. It is not clear that Ishmael would have been heir to Abraham's office as chief, even if Sarah's scheme had gone forward, especially if Keturah's son Joktan was born first. So who was Abraham's first-born son? My guess is Joktan, the first-born of Keturah, and that Abraham acquired Keturah as a wife when he went to the Negev (Gen. 12:9) after consulting the Seer at Shechem (Gen. 12:6). The number 3 taunts us and compels us to seek the hidden, just as Abraham sought guidance about his unknown future at the Diviner’s Oak near Hebron (Gen.13:18). At this very place he later looked up and saw 3 “men” coming to him and ordered 3 measures of flour to make cakes and brought to these visitors 3 gifts: curds, milk and a calf. And Abraham interceded for Sodom 3 times (Gen. 18). Consider the mystery surrounding Isaac. On the surface there appears to be so little information about Isaac (compared to Abraham and Jacob). This led some biblical scholars to speculate that Isaac may be a fictional character, created to bridge the generations. We may dismiss this theory since Genesis provides more information about Isaac than is generally recognized and what we are given could not have been invented, nor could it be the product of an editor. The key to discovery is the seeking of the hidden third son. The text presents us with this picture of Isaac: He had two wives, as did his father and his father’s father. Rebecca was his cousin wife, to whom he was married shortly before Abraham died. She was Isaac's second wife. Isaac's first wife was a half-sister (again following his father and grandfather). She lived in the area of Beersheba where Abraham had married Keturah and where he settled after his experience at Mt. Moriah (Gen. 22:19). Isaac’s rule in Beersheba is evident in Gen. 26 where we are told that he reopened the wells dug by his father between Beersheba and Gerar. This explains why Abraham’s servant brought Rebecca to Beersheba rather than to Hebron, Sarah's settlement. According to tradition, Isaac's first wife was called Judith (feminine equivalent of Judah). Just as Abraham needed 2 wives to establish himself in the land, so Isaac needed 2 wives to maintain his father's territory. This explains the urgency of getting Isaac a wife before Abraham's death. The picture becomes clearer when we imagine Judith in Beersheba and Rebecca in the area of Hebron. We are now able to speculate that Isaac had 3 sons: Jacob and Esau by Rebecca, and by Judith a son who is not named in the text. However, since the kinship of Abraham’s people traces lineage through the father and the mother, this pushes the line of Judah back several generations. It also establishes a connection between the Aramaen house of Terah and the royal house of Sheba. Revisiting Gen. 10 and Gen. 11:10-26, we find confirmation of this connection. Terah (Abraham's father) and Sheba are descendents of Eber’s two sons Peleg and Joktan. Terah descends from Peleg and Sheba from Joktan. Keturah's father was Joktan and she named her firstborn son Joktan, after her father, as was the custom. Joktan is one of the three firstborn sons of Abraham. He is a hidden third son, and probably Abraham's firstborn. Interesting read! Was this article hypothetical or based on authentic sources? So I derive from this that Keturah’s firstborn was named Zimran not Yaqshan (based on the text). And secondly, the name of the son wasיָקְשָׁן Yaqshan and not “Joktan” (written יָקְטָן in Hebrew and pronounced Yaktan). Greetings to you, Aboo Imraan, and welcome to Just Genesis! You are correct that the more accurate spelling is Yaqshan or Yaktan. Joktan is the spelling in many English translations. The lists of rulers (Horim) in Genesis doesn't always list the firstborn son first. This is because each ruler had two wives and two firstborn sons. The ruler's first wife was a half-sister (as was Sarah to Abraham) and her firstborn son is listed first if he ascended to the throne of his biological father. The firstborn of the cousin or niece wife was the heir to the territory over which his mother's father ruled. Keturah was Abraham's cousin or niece wife and these wives named their firstborn sons after their fathers. It is possible that Keturah's father was Zimram and that Zimram the Younger was Abraham's firstborn son. The evidence, however, suggests that Yaqshan was Keturah's firstborn son. I believe that Keturah's father's name was Yaqshan, not Zimram. I may be wrong. The naming prerogative of the cousin bride was already a custom in the time of Lamech (Gen. 4). Lamech’s daughter Naamah married her patrilineal cousin Methuselah and named their firstborn son Lamech after her father. Lamech the Younger would have ascended to the throne of his maternal grandfather. I would be very interested in your thoughts on Zimram and why you think he may have been Abraham's firstborn son by Keturah? To understand this research you will need to look into the marriage and ascendancy pattern of Abraham's Horite people. There is no one text in Genesis that speaks of Isaac having two wives. We have to uncover this by analysis of the matrimonial moeity and kinship structure that characterizes Abraham and his ancestors and his descendants. This is my unique contribution to Biblical Anthropology. The cousin wife was always the second wife, taken shortly before the ruler-to-be ascended to the throne of his father. Since Rebecca was Isaac's cousin wife, we can safely assume that she was Isaac's second wife. His first wife was a half-sister living in Beersheba. There is no reason to believe that Isaac did not adhere to the marriage and ascendancy pattern of his Horim (Horite ancestors). If after you read this research you have further questions, please contact me. Abraham had 3 wives according to Genesis; Sarai (Sryh/Sry/Shara), Hagar (hgr/hjr) and Keturah (qtwrh/qtr). Sarai's name derives from the Semtic word for concubine and she was treated as a concubine when she was traded to 2 royals, Pharaoh & Abimelech, as a guarantee of safety for Abraham. Hagar is an Old South Arabic name and it means 'the city'. 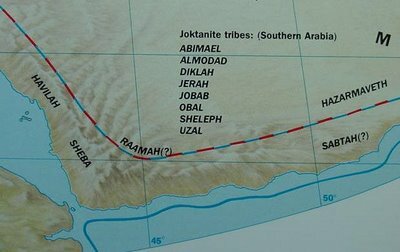 The Arabic name, Hajar, is still used for that area which in ancient times included the port of Bahrain; an important port of trade on the eastern trade route. Keturah is a personification of the incense trade. She is the mother of the Arabian caravan tribes. The only real person here is Sarai, the concubine who became Sarah. Sara in Arabic means happiness. Her son, Isaac or laughter was named after her and not his father indicating her status as a concubine. Abraham married according to the pattern of Horite rulers. Thank you for an interesting read. Regarding this statement: "She (Rebekah) lived in the area of Beersheba where Abraham had married Keturah and where he settled after his experience at Mt. Moriah (Gen. 22:19)." Abraham lived there, but I don't think Isaac did after his experience on Mt. Moriah. Instead, he moved to Beer-lahai-roi (Gen. 24:62, Gen. 25:11), the place where Hagar was met by an angel. Elaine, You are asking very good questions. Abraham's cousin wife, Keturah, was a descendant of Sheba and lived in Beer-Sheba, which means the "Well of Sheba." This is where Isaac was living when the servant returned with Rebecca. This is in the Negev and Genesis 24:62 says that Isaac was living in the Negev. Beer Lahai Roi is in the wilderness area of Paran, south of Beersheba. Isaac had half-sisters where Hagar and Ishmael lived in the wilderness of Paran and where Keturah and Abraham lived in the "wildernesss of Beersheba" (Gen. 21:14). Once he ascended to the throne of his father Abraham, Isaac's two wives would have lived in separate households on a north-south axis. Beer Lahai Roi is south of Beersheba. These are likely to two settlements in which his wives lived and these settlements would then have marked to northern and southern boundaries of Isaac's territory. In Isaac's time all of this area was within the territory controlled by the Horites of Edom. I don't understand how this fits with the Biblical account of Abraham being from Ur of the Chaldees. Another fine website explains that the Ur being referenced is actually Urfa in the north of Mesopotamia instead of the more famous Ur in the south. How do you explain the origin of Abraham? There were many places with the name Ur, Ar, or Er in the ancient world. Uruk, Eridu are examples. There is an Eridu in Nigeria also. Orfah is not a likely site. "Ur of Chaldea" simply means Ur of the Akkadian empire, Nimrod's territory. A variant of the name is Hur and Hor. The "father" of Bethlehem was Hor, a reference to the Horites, devotees of Horus, called "son of God." If you read the Genesis account carefully, you will see that Abraham didn't come to Canaan from Ur. He came from Haran, which is north of Ur on the Euphrates River. We actually don't know where Abraham was born. Genesis does not tell us. He could have been born in Haran. Abraham's father (Terah) controlled river trade on the portion of the Euphrates that extended between Ur (south) and Haran (north). Terah died in Haran and left his territory to his oldest living son, Nahor. Abraham became a sent-away son to whom God promised a kingdom. The Horite rulers maintained two wives on a north-south axis; at the boundaries of their territories. Terah's wives resided in Haran and Ur. Likewise, Abraham's wives resided in Hebron (Sarah) and Beersheba (Keturah); also on a north-south axis.